It seems that The Requisition Technician has turned an old joke into reality – except Req Tech sees that three-hundred and raises it four-hundred. As you’ll read in a moment, $700 is his and many other contractors’ large and lucky number. I spoke with a homeowner today who’s getting bids for a new furnace. During our discussion I learned that Req Tech had just replaced his furnace’s gas valve and pilot assembly for $700. That’s for 90 minutes of work and parts that cost $200 wholesale. The same homeowner went on to tell me that Req Tech replaced the same furnace’s circuit board last year for $700. That for 60 minutes of work and a part that costs $60. Note the apparent disconnect between the time and materials costs and the bills presented. That discussion brought to mind a memorable service call from four years ago. A general contractor had inadvertently paired a Freon evaporator coil with a Puron condenser. Naturally the air conditioner didn’t work. The general couldn’t figure it out, so he called Req Tech who repaired a refrigerant leak for $700. That’s for three hours of work and less than $100 in materials. The air conditioner still didn’t work, so RT told the general that he needed to replace his brand new compressor for a couple thousand. That call was memorable for several reasons. First, I was just becoming aware of the fact that many mini-contractors were mimicking mega-contractor pricing. Second, because I was also just becoming aware of Req Tech’s amazingly misguided methods. 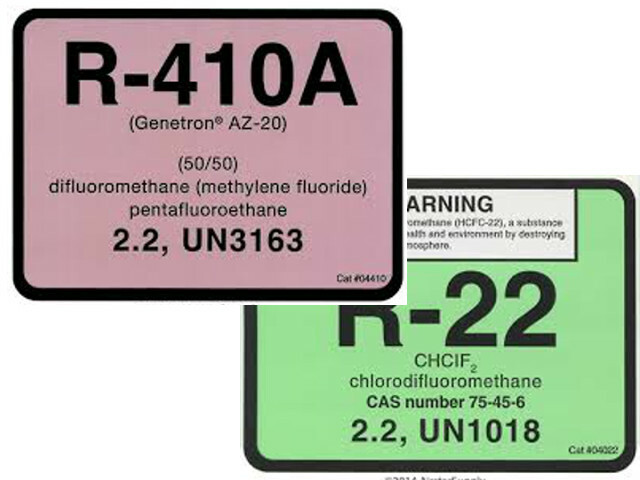 These stickers distinguish Freon from Puron. The pink sticker was in plain sight. The green sticker was behind a panel that’s normally removed during the diagnosis. I guess RT never removed the panel. Req Tech must’ve been on some kind of streak because shortly after that a business owner posted an online review of RT. Req Tech reportedly replaced a fuse box for $700. That’s for 90 minutes of work and parts that cost $100. The air conditioner still didn’t work, so RT told the business owner that he needed a new air conditioner for five grand. The owner didn’t want any of that action, so he called a different repairman who diagnosed a faulty circuit breaker. You don’t have to be Rain Man to see the pattern. Mini-contractors routinely charge six to seven-hundred dollars whenever they think they can get away with it. That’s especially true when Freon, circuit boards or other things that seem expensive (but aren’t always) are involved. Mega-contractors charge a hundred more than that. Average it out and $700 is indeed their lucky your unlucky number. Roll the dice by hiring one of those mini-mega-repairmen and you’ll have to ask yourself one question: Do I feel lucky?